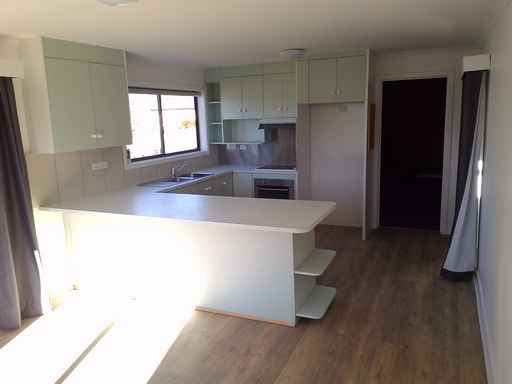 Michael Thomson worked his magic on the second hand kitchen bought off Gumtree and created a U shaped kitchen with a wide breakfast bar. the wall oven that came with the kitchen was not used. An Australian made Westinghouse under bench oven was purchased from the Good Guys in Hobart. An end of line model it was a $900 oven that for sale at around $500. Good saving. The only difference to the new model was handles! Michael created some corner shelving to fill a space using spare cupboard doors and sides. 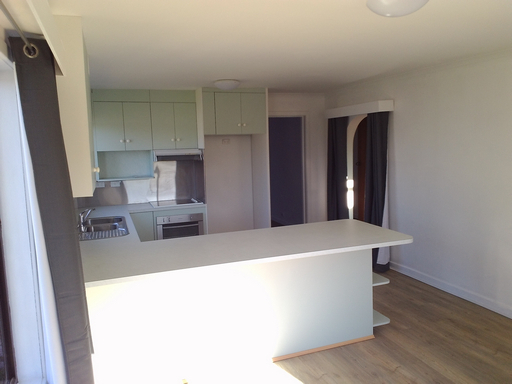 There was very little left after creating the kitchen. One drawer unit which we will use in our studio at home and the carcass of the wall oven. All other cupboards, benchtops etc were used. 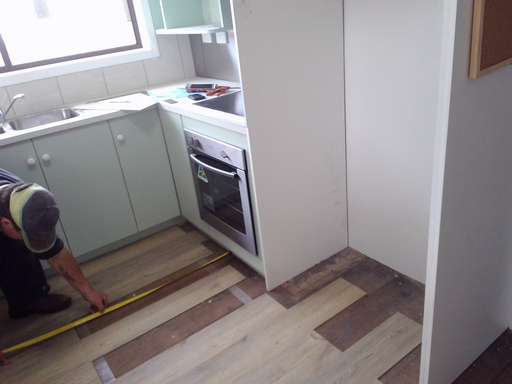 The original dishwasher had been checked out but when installed it leaked so the Vulcan Dishlex that came with the Gumtree kitchen was installed instead. No problem. A stainless steel splashback was made and put in behind the stove top for easy cleaning and tiles used behind the sink and between cupboard and breakfast bar. A four way power socket was also installed. 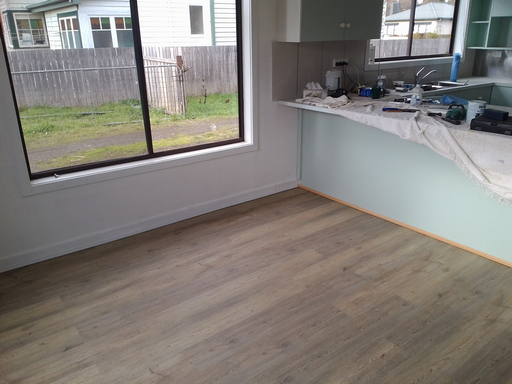 The last thing to go in was the new flooring, this came from Deloraine Carpets and is loose lay vinyl planks. 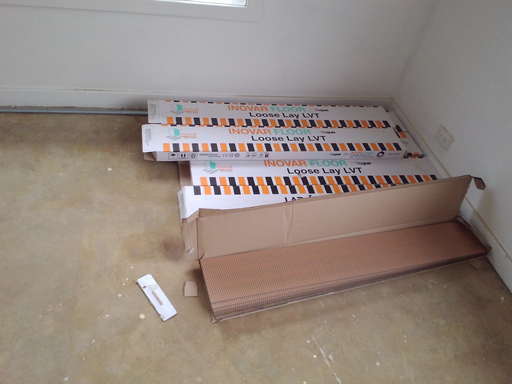 They only require some double sided tape around the perimeter of the room and down they go. The only issue we had was that they were going over concrete slab in one half of the room and timber floorboards in the other. The floorboards were a little cupped and this means that the vinyl did not lay as flat as it should. The lesson learned is to go over the substrate with a level to see what needs to be done. We should have planed down the high points. Otherwise it went down very well and although in a room with straight walls no cover is need at the edges we used some laminate flooring trim because the walls and skirting are definitely not straight!